Generalized anxiety disorder (GAD) is a common mental disorder marked by persistent anxiety and worries as well as multiple psychological and physical symptoms.1 GAD is a burden on the society because it is costly and has a significant adverse effect on the quality of life.2 The serotonin (5-hydroxytryptamine [5-HT]) transporter, 5-HT receptors, are promising therapeutic targets for treating GAD, and currently most psychiatrists prefer the use of selective serotonin reuptake inhibitors (SSRIs) and serotonin–norepinephrine reuptake inhibitors (SNRIs).3 In addition, the recent guidelines suggest SSRI/SNRI as the first-line pharmacotherapy for GAD.4,5 Vortioxetine is a multimodal antidepressant approved for the treatment of major depressive disorder (MDD) by the US Food and Drug Administration in September 2013. The mechanism of action of vortioxetine is thought to be a combination of two pharmacological modes of action: the direct modulation of receptor activity and the inhibition of the serotonin transporter. In vitro studies indicate that vortioxetine functions as a 5-HT3 and 5-HT7 receptor antagonist, a 5-HT1B receptor partial agonist, a 5-HT1A receptor agonist, and an inhibitor of the 5-HT transporter.6,7 Several meta-analyses have proved the efficacy of vortioxetine in the treatment of MDD,8–10 and one of them is our work.10 The symptoms of anxiety and depression respond to similar agents, suggesting that the two conditions share some common neuropathology. However, the antianxiety effect of vortioxetine in treating GAD is uncertain. One recent study conducted by Pae et al11 suggests that vortioxetine may have a potential as an another treatment option for GAD. Based on the newest available data, we conducted a meta-analysis to assess the efficacy and safety of multiple doses of vortioxetine in the treatment of GAD in adults. PubMed, Cochrane Library, PsycINFO, and the Clinical Trials databases (from 2000 through 2015) were searched using the keywords “vortioxetine OR LuAA21004 OR Brintellix” AND “anxiety OR anxiety disorder OR mood disorder”. The abstracts of the annual meetings of the American Psychiatric Association and previous reviews were also searched to identify additional trials. The search was limited to individual randomized controlled trials (RCTs) and there was no language restriction. Trials that met the following criteria were included: parallel group, double-blind, placebo-controlled with random assignment, and patients (≥18 years old) primarily diagnosed with GAD according to the Diagnostic and Statistical Manual of Mental Disorders, fourth edition, text revised (DSM-IV-TR). Patients who were included had a Hamilton Anxiety Rating Scale (HAM-A) total score ≥20 and a HAM-A score ≥2 on both item 1 (anxious mood) and item 2 (tension), and a Montgomery–Åsberg Depression Rating Scale (MADRS) (33) total score ≤16 at screening and baseline. In addition, the patients did not have any concurrent psychiatric disorder other than GAD or any prior history of psychiatric disorders such as manic or hypomanic episode, schizophrenia, or substance use disorder. Patients had no recent history of substance abuse or severe suicidal ideation or behavior and previously they responded to adequate treatment with SSRI or SNRI. The authors, Jie Fu and Lilei Peng, identified and agreed upon the studies meeting these criteria. The study quality was assessed with Jadad scores.12 The Jadad score is an instrument used to assess the quality of RCTs. It includes three items: randomization, blindness, and dropouts. The score standards and the results of our studies included are shown in Table 1. A total score ≥3 suggests that the study is of high quality. All of the studies included are of high quality. The information extracted included the study design, patient selection criteria, medical dose, trial duration, age, region of the study, baseline HAM-A rating scores, posttreatment HAM-A rating scores, the numbers randomized, and clinical outcomes. Clinical outcomes included response and adverse effects. The efficacy of vortioxetine was assessed in the intent-to-treat samples using the last observation carried forward in patients with at least one posttreatment rating. Response was defined as ≥50% decrease from baseline HAM-A total scores. Data were abstracted by one investigator and checked by a second investigator. Any discrepant data were again reviewed by the investigators to ensure that accurate data were obtained. The number of responders, adverse effects, and individuals randomized into the vortioxetine and placebo groups for each trial were statistically combined using the Mantel–Haenszel random-effects or fixed-effects model. The effects were expressed as odds ratios (ORs) with 95% confidence interval (CI), test of significance (Wald Z), number of contrasts (N), and P-values. The overall OR for the meta-analysis was the mean of the ORs computed for each contrast weighted for sample size and the event rate. The incidence of adverse effects between the vortioxetine and placebo groups was determined using the Mantel–Haenszel model, and the results were expressed as the ORs with the 95% CI. A sensitivity analysis was performed to rule out the possibility that any single study strongly influenced the pooled effect. Publication bias was assessed with Egger’s test.13 Chi-square tests and the I2 statistic derived from the chi-square values were used to test heterogeneity among the contrasts. I2 values of 25%, 50%, and 75% indicated low, moderate, and high heterogeneity, respectively.14 The meta-analysis was conducted using RevMan 5.2 software (Cochrane Collaboration, London, UK) and Stata 10.0 software (StataCorp LP, College Station, TX, USA). 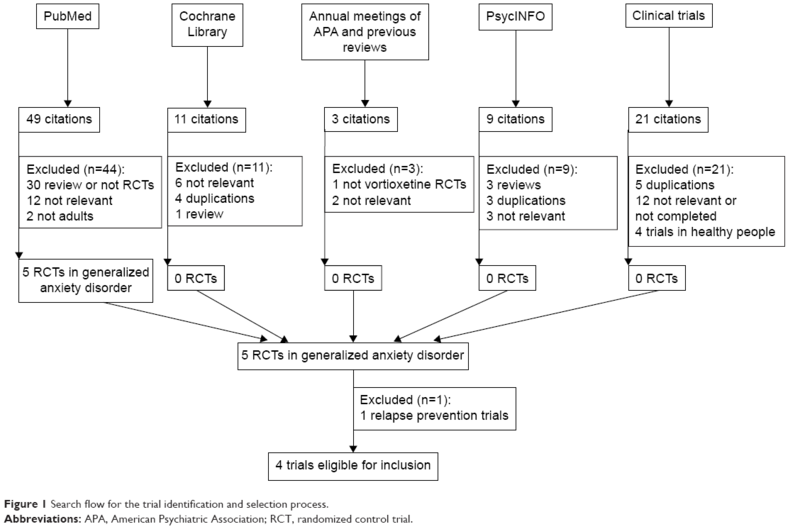 After searching PubMed, Cochrane Library, PsycINFO, and the Clinical Trials databases; the abstracts of the annual meetings of the American Psychiatric Association; and previous reviews, four articles were included in the study (Table 2).15–18 The search flow diagram is shown in Figure 1. One recent article by Baldwin and Loft,19 published in July 2012, was excluded because that study focused on the efficacy and tolerability of vortioxetine in the prevention of relapse of GAD in patients with remission after acute treatment, which did not meet the inclusion criteria. Only information included in the publication was included in our meta-analysis. Abbreviations: HAM-A, Hamilton Anxiety Scale; T, treatment group; C, control group. Figure 1 Search flow for the trial identification and selection process. Abbreviations: APA, American Psychiatric Association; RCT, randomized control trial. A total of four studies with 1,843 subjects (1,230 patients in the vortioxetine group and 613 patients in the placebo group) were included in the analysis (Table 2). 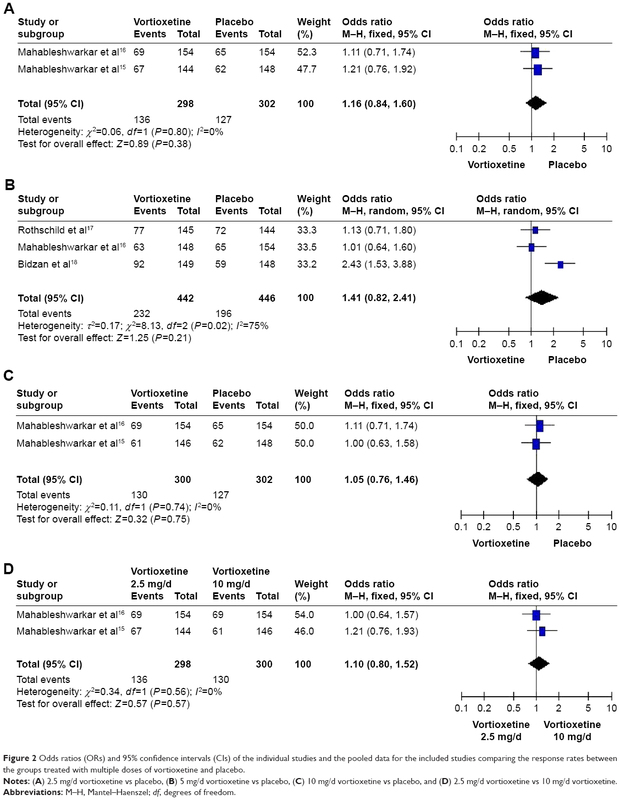 The overall OR observed for the groups treated with multiple doses (2.5, 5, and 10 mg/d) of vortioxetine compared to placebo were 1.16 (95% CI=0.84–1.60, Z=0.89, P=0.38), 1.41 (95% CI=0.82–2.41, Z=1.25, P=0.21), and 1.05 (95% CI=0.76–1.46, Z=0.32, P=0.75), respectively. Besides, the overall OR observed for the group treated with 2.5 mg/d of vortioxetine compared to that with 10 mg/d of vortioxetine was 1.10 (95% CI=0.80–1.52, Z=0.57, P=0.57) (Figure 2, Table 3). The results showed that there was no statistically significant difference for the response rate among different groups. In addition, there was obvious heterogeneity for the response rate (I2=75%) in the group treated with 5 mg/d vortioxetine compared to placebo. Figure 2 Odds ratios (ORs) and 95% confidence intervals (CIs) of the individual studies and the pooled data for the included studies comparing the response rates between the groups treated with multiple doses of vortioxetine and placebo. Notes: (A) 2.5 mg/d vortioxetine vs placebo, (B) 5 mg/d vortioxetine vs placebo, (C) 10 mg/d vortioxetine vs placebo, and (D) 2.5 mg/d vortioxetine vs 10 mg/d vortioxetine. Abbreviations: M–H, Mantel–Haenszel; df, degrees of freedom. Abbreviations: GAD, generalized anxiety disorder; RCT, randomized control trial; T, treatment group; C, control group. Table 4 shows the common adverse effects related to vortioxetine in the treatment of GAD. The most common side effects were nausea and headache. Compared to placebo, nausea occurred more frequently following treatment with high doses (5 and 10 mg/d) of vortioxetine (OR=2.99, 95% CI=1.31–6.84, Z=2.60, P=0.009; OR=2.80, 95% CI=1.85–4.25, Z=4.85, P<0.00001, respectively) (Figure 3), but no significant differences were observed for headache (Figure 4). The sensitivity analysis indicated that the pooled response rate and adverse effects were not influenced when we tried to rule out any of the included studies (data not shown). Note: “–” represents that side effect was not assessed. Figure 3 Odds ratios (ORs) and 95% confidence intervals (CIs) of the individual studies and the pooled data for the included studies comparing the nausea rates between the groups treated with multiple doses of vortioxetine and placebo. Notes: (A) 2.5 mg/d vortioxetine vs placebo, (B) 5 mg/d vortioxetine vs placebo, and (C) 10 mg/d vortioxetine vs placebo. 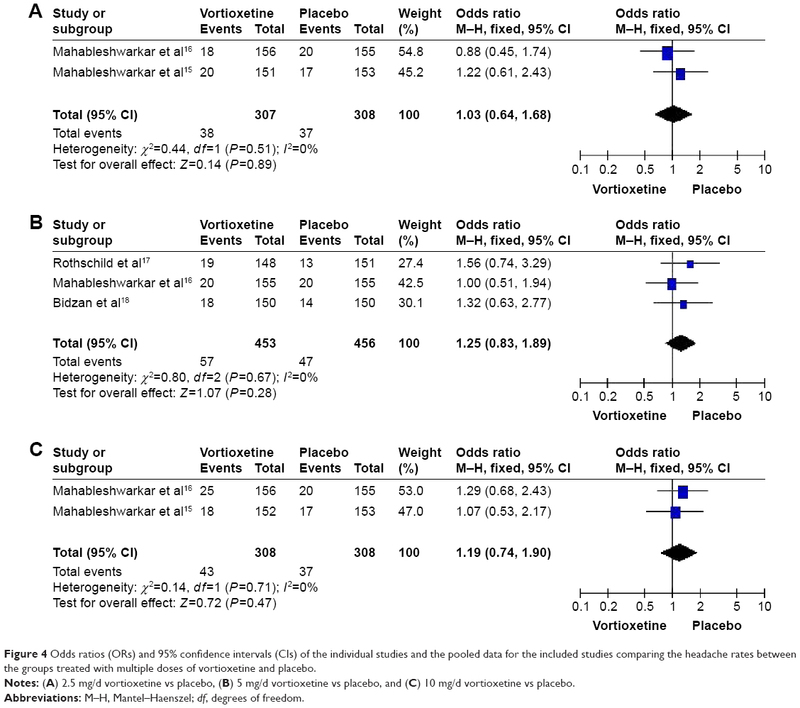 Figure 4 Odds ratios (ORs) and 95% confidence intervals (CIs) of the individual studies and the pooled data for the included studies comparing the headache rates between the groups treated with multiple doses of vortioxetine and placebo. Due to a small number of trials in our meta-analysis, we used an Egger’s test (P=0.249) to determine if there was publication bias; the result indicated that no publication bias was found. This meta-analysis showed no significant improvement for vortioxetine in the treatment of GAD compared to placebo. Our results are not consistent with those of the previous meta-analysis.11 The previous meta-analysis conducted by Pae et al demonstrated statistically superior efficacy for vortioxetine in the treatment of GAD compared to placebo. The reason for the lack of congruence between these two meta-analyses may be the difference in the methodologies. The previous meta-analysis primarily relied on the analysis of a continuous measurement (HAM-A change from baseline) and all the randomized subjects were included in the analysis. However, our meta-analysis primarily relied on the categorical measure (% responders) and the analyses were separately performed according to the doses of vortioxetine. The sensitivity analysis of the previous meta-analysis showed that their results were unstable, whereas the overall outcomes of our meta-analysis were stable. In our meta-analysis, the pooled response rates were not influenced when we tried to rule out any of the included studies, which may be a large placebo response interfering with the ability to demonstrate vortioxetine’s benefits. The studies that showed negative results15–17 had a higher placebo response rate than those with positive results18,20 (data not shown). Furthermore, the negative results obtained might be due to the large sample size, which concealed the results of the studies with positive results, and the effect could not be overcome by the meta-analytic method. In the clinical studies analyzed, the common adverse effects of vortioxetine included nausea and headache. However, these symptoms were mild to moderate in intensity.17,18 Our results indicated that nausea occurred more frequently following treatment with high doses (5 and 10 mg/d) of vortioxetine when compared to the placebo group. There were no significant differences for headache among different groups. A sensitivity analysis suggested that none of the included studies strongly determined the pooled adverse effects rate. The response rate and the occurrence of nausea between the groups treated with 5 mg/d of vortioxetine and placebo had obvious heterogeneity. Many factors contributed to the significant heterogeneity. Of note, the negative studies had a strong placebo response, which likely contributed to the difficulty in detecting the effect of vortioxetine. Furthermore, other factors, including age (the mean age of one study18 was obviously found to be less than that of the other studies) and region, were different. Age may be an important factor which influences people’s response to the medicine. The two negative studies were conducted in the USA,16,17 while one positive study was conducted in both Europe and Africa.18 Difference in regions may influence the results due to their particular condition or implementation. Sexual dysfunction often occurs when selective 5-HT reuptake inhibitors are administered for the treatment of mood disorders.21,22 This side effect adversely affects the quality of life of the patients with antianxiety and reduces the compliance with treatment. Recently, Bijlsma et al suggested that the sexual side effects of SSRI may be mediated by their inhibitory effects on dopamine signaling in the brain. Thus, the authors suggested that the clinical development of novel antidepressants or anxiolytics should focus on compounds that simultaneously increase both serotonin and dopamine signaling.23 In vivo nonclinical studies have demonstrated that vortioxetine enhances the levels of serotonin, noradrenaline, dopamine, acetylcholine, and histamine in specific areas of the brain.6 This may be the reason that vortioxetine does not significantly cause sexual dysfunction. In the studies included in our meta-analysis, only one study indicated that vortioxetine led to sexual dysfunction.16 Thus, we could not conclusively assess whether vortioxetine causes sexual dysfunction in the treatment of patients with anxiety. This potential side effect warrants additional research. The limitations of this meta-analysis are as follows: 1) A small number of studies are included and the sample size is relatively small, which may have influenced the reliability of the results. 2) Due to incomplete data, we did not compare the onset time between the groups treated with multiple doses of vortioxetine and placebo. 3) All of the included trials were supported by the Takeda Pharmaceutical Company Ltd as part of a joint clinical development program with H. Lundbeck A/S, which may have influenced the results. 4) Our meta-analysis only included the published clinical trials, so we may not have identified all RCTs investigating the effects of vortioxetine in patients with GAD, especially unpublished studies. The variation may influence the results and prevent us from conducting meta-analysis for other outcomes. 5) Due to incomplete data, we did not perform the efficacy analysis in the treatment of more severe anxiety (≥25 in baseline HAM-A total score) compared to placebo. 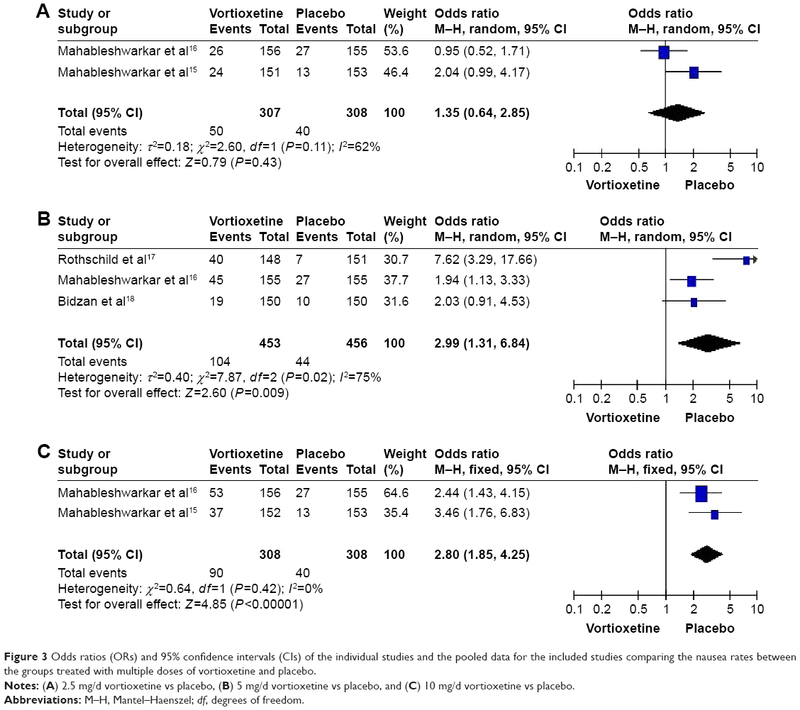 In conclusion, our meta-analysis of published RCTs showed that vortioxetine is not superior to placebo in reducing HAM-A scores in individuals with a primary diagnosis of GAD, and nausea was more frequent with higher doses. So the current evidences do not support using vortioxetine for the treatment of GAD. Due to the small number of trials in our meta-analysis, the results should be interpreted and translated into clinical practice with caution. In the future, more studies are needed to fully define the efficacy, optimal doses, and safety of vortioxetine in the treatment of GAD. American Psychiatric Association. Diagnostic and Statistical Manual of Mental Disorders. 5. Arlington, VA: American Psychiatric Publishing; 2013. Goorden M, Muntingh A, van Marwijk H, et al. Cost utility analysis of a collaborative stepped care intervention for panic and generalized anxiety disorders in primary care. J Psychosom Res. 2014;77(1):57–63. Latas M, Stojković T, Bosnjak MC, et al. How do we treat generalized anxiety disorder? Srp Arh Celok Lek. 2014;142(3–4):204–212. Bandelow B, Sher L, Bunevicius R, et al. Guidelines for the pharmacological treatment of anxiety disorders, obsessive-compulsive disorder and posttraumatic stress disorder in primary care. Int J Psychiatry Clin Pract. 2012;16:77e84. Baldwin DS, Anderson IM, Nutt DJ, et al. Evidence-based pharmacological treatment of anxiety disorders, posttraumatic stress disorder and obsessive-compulsive disorder: a revision of the 2005 guidelines from the British Association for Psychopharmacology. J Psychopharmacol. 2014;28:403e39. Mørk A, Pehrson A, Brennum LT, et al. Pharmacological effects of vortioxetine: a novel multimodal compound for the treatment of major depressive disorder. J Pharmacol Exp Ther. 2012;340(3):666–675. Pae CU, Wang SM, Han C, et al. Vortioxetine: a meta-analysis of 12 short-term, randomized, placebo-controlled clinical trials for the treatment of major depressive disorder. J Psychiatry Neurosci. 2015;40(3):174–186. Berhan A, Barker A. Vortioxetine in the treatment of adult patients with major depressive disorder: a meta-analysis of randomized double-blind controlled trials. BMC Psychiatry. 2014;14:276. Fu J, Chen Y. The efficacy and safety of 5 mg/d vortioxetine compared to placebo for major depressive disorder: a meta-analysis. Psychopharmacology (Berl). 2015;232(1):7–16. Pae CU, Wang SM, Han C, et al. Vortioxetine, multimodal antidepressant for generalized anxiety disorder: a systematic review and meta-analysis. J Psychiatr Res. 2015;64:88–98. Mahableshwarkar AR, Jacobsen PL, Serenko M, Chen Y. A randomized, double-blind, fixed-dose study comparing the efficacy and tolerability of vortioxetine 2.5 and 10 mg in acute treatment of adults with generalized anxiety disorder. Hum Psychopharmacol. 2014;29(1):64–72. Mahableshwarkar AR, Jacobsen PL, Chen Y, Simon JS. A randomised, double-blind, placebo-controlled, duloxetine-referenced study of the efficacy and tolerability of vortioxetine in the acute treatment of adults with generalised anxiety disorder. Int J Clin Pract. 2014;68(1):49–59. Rothschild AJ, Mahableshwarkar AR, Jacobsen P, Yan M, Sheehan DV. Vortioxetine (Lu AA21004) 5 mg in generalized anxiety disorder: results of an 8-week randomized, double-blind, placebo-controlled clinical trial in the United States. Eur Neuropsychopharmacol. 2012;22(12):858–866. Bidzan L, Mahableshwarkar AR, Jacobsen P, Yan M, Sheehan DV. Vortioxetine (Lu AA21004) in generalized anxiety disorder: results of an 8-week, multinational, randomized, double-blind, placebo-controlled clinical trial. Eur Neuropsychopharmacol. 2012;22(12):847–857. Baldwin DS, Loft H, Florea I. Lu AA21004, a multimodal psychotropic agent, in the prevention of relapse in adult patients with generalized anxiety disorder. Int Clin Psychopharmacol. 2012;27(4):197–207. Liebowitz MR, Stein MB, Tancer M, et al. A randomized, double-blind, fixed-dose comparison of paroxetine and placebo in the treatment of generalized social anxiety disorder. J Clin Psychiatry. 2002;63(1):66–74. Herman JB, Brotman AW, Pollack MH, Falk WE, Biederman J, Rosenbaum JF. Fluoxetine-induced sexual dysfunction. J Clin Psychiatry. 1990;51(1):25–27. Musher JS. Anorgasmia with the use of fluoxetine. Am J Psychiatry. 1990;147(7):948. Bijlsma EY, Chan JS, Olivier B, et al. Sexual side effects of serotonergic antidepressants: mediated by inhibition of serotonin on central dopamine release? Pharmacol Biochem Behav. 2014;121:88–101.